The 2019 Aussie Millions is underway and the Main Event is presently making its way to the final table. Two of the event’s largest High Roller tournaments have already concluded and two big names have padded their bankrolls nicely. On Saturday, Rainer Kempe defeated Toby Lewis heads-up and took down the AU$25,000 Challenge for a $595,055 payout. Lewis did one better on Monday, defeating Manig Loeser heads-up in the AU$50,000 Challenge for $588,999. This gave Lewis over $1 million in earnings in less than a week. 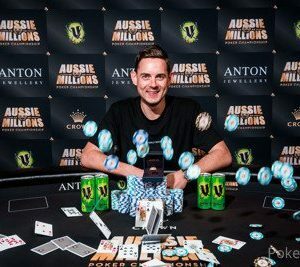 The first of three big High Roller events at Aussie Millions was the AU$25,000 Challenge. This year’s $25k Challenge drew a record field of 151 entries and drew some of the top competition from around the world. It took all of the first day and some of Day 2 to reach the final table but it produced a superstar final. PCA Main Event champion Chino Rheem made the final along with Jack Salter, Luke Marsh, and Toby Lewis of the UK. German high stakes superstar Rainer Kempe also made his way to the final table. Chino Rheem added a big score to his bankroll in this event. After winning $1.56 million in the PCA Main Event earlier this month, he managed to take third in this tournament, earning just over $300k. Once Rheem was eliminated, Toby Lewis and Rainer Kempe were left to play heads-up. With just 1 million in chips (approximately 20 big blinds) separating the two, the pair decided to work out a deal. Once the deal was reached, they went all-in blind on the very first hand of heads-up play. Kempe held Kd-4d and Lewis Jc-9d. Kempe spiked a four on the turn and that was enough to give him the champions ring. Toby Lewis finishes runner-up, earning $566,074 after the chop. Kempe got the ring and $595,055. What do you do after finishing second in a big high roller event? How’s taking down the very next event sound? That’s exactly what Toby Lewis did on Tuesday by taking down the AU$50,000 Challenge. This event also set a record with 62 entries and once again, the final table was a stacked affair. This time around the final table included Tobias Ziegler, Michael Zhang, Dominik Nitsche, Manig Loeser, and Toby Lewis. At the start of the final day of play, Toby Lewis led the final five players. By the time that heads-up play was reached, Lewis had a nearly 8:1 chip lead over Manig Loeser. The pair initially decided to play things out and it seemed that Lewis would quickly take the title. Loeser was all-in with pocket jacks against pocket queens for Lewis. However, four diamonds ran out on the board and Loeser had the jack of diamonds for the flush and a double up. A short time later, Loeser doubled up again, this time with pocket nines against pocket eights for Lewis. After his second double, Loeser had significantly closed the gap and Lewis was willing to deal. After a deal was struck, the pair went all-in blind. Lewis had J-2 against 9-3 for Loeser. Lewis turned a jack and took the title. Due to the deal, Loeser took $556,017 for second place. Lewis ended up with $588,999. This gives Toby Lewis over $1.18 million in earnings in less than a week’s time. This was Lewis’ fourth cash at this year’s Aussie Millions and just the latest in massive scores for the UK superstar. Last year, Lewis won the Aussie Millions Main Event for $1.17 million. In two year’s time, Lewis has earned a third of his $6.34 million in career live poker tournament earnings.